Running Time: 2 hr. 6 min. In 1993, Arnold Schwarzenegger starred in Last Action Hero, a satire of the action film genre. While not a well-made film, its premise was prescient. The days of big Hollywood action star are over. The lineage dates back to a swashbuckling Douglas Fairbanks and runs through such paragons as John Wayne, Steve McQueen, Clint Eastwood, Sylvester Stallone and Schwarzenegger. Today, the action genre survives and continues to thrive. But our craving for the larger-than-life hero has fallen prey to decades without major wars—movie heroes were partly born from our desire to animate their real-life archetypes—and advances in computer-generated imagery that have democratized action casting. Nowadays, any actor can be the hero, including Tom Cruise, Matt Damon, Robert Downey Jr., Tobey Maguire and even Scarlett Johansson. Big-budget action movies once served their lead actor; today it’s the other way around. The dual function of The Expendables series is inherent in its title. The characters are over-the-hill paramilitary mercenaries out to show they still have what it takes to save the day. The actors playing these roles are a cadre of over-the-hill action stars out to prove they can still entertain audiences (and earn a paycheck). But it’s a function that was served four years with the first Expendables film. 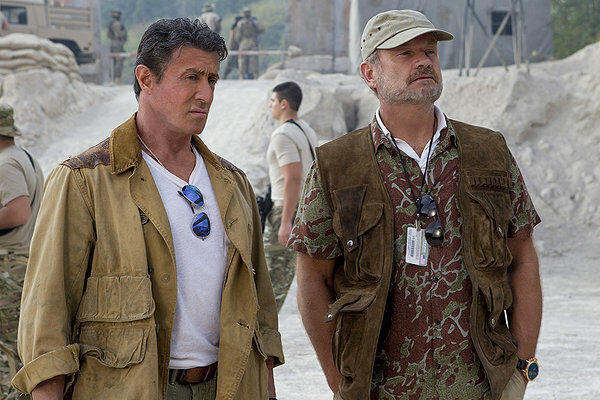 Two sequels later comes The Expendables 3, which feels as long in the tooth as its geriatric cast. The plot, such as it is, has Stallone leading a band of younger Expendables to apprehend a brutal international arms dealer played by Mel Gibson. But when the whippersnappers are captured, it falls to Stallone and his old crew to, well, save the day. Unfortunately, the rest of The Expendables 3 is formulaic filler. The younger Expendables—which include boxer Victor Ortiz, MMA star Ronda Rousey and Kellan Lutz (Emmett Cullen)—are a charmless, witless bore, although I wonder if that was somewhat intentional given the film’s premise. And at some the film starts taking the cast’s cheeky comeback too seriously, inserting extended action sequences that are little more than a collage of cannon fodder and bad CGI. It would have been wiser for the film to fully embrace its satirical side, a la Tropic Thunder or even Last Action Hero. Otherwise, for everyone without a frame of cinematic reference that predates 1990, the film feels much like its title suggests: expendable. The fun of The Expendables is that it makes you want to watch Rocky and Mad Max and Blade and Desperado all over again. The best action movie of 2014. Amazing cast. It's fun, wild, entertaining and explosive. Best one in the trilogy so far. Sylvester Stallone is beyond amazing in this. Thank you Sly for an awesome fun movie. You are the best.